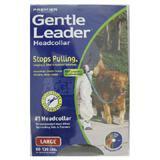 The Gentle Leader® Headcollar is NOT a muzzle. 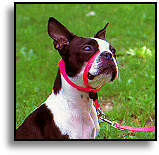 When fitted properly, your dog is free to open his mouth to eat, drink, pant, fetch, bark and even bite - except when you close his mouth by pulling on the leash. 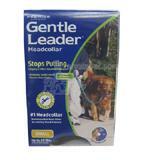 The Gentle Leader® Headcollar features two soft nylon straps - the collar portion fits high at the top of the neck, and the nose loop fits loosely and comfortably across the base of the muzzle. 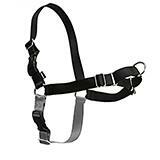 Each strap has a distinct and important effect. 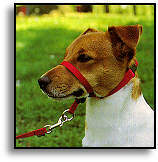 The Nose Loop - Dogs are naturally "pack" animals with a highly structured social order. One of the ways the "pack leader" will demonstrate his position is to gently but firmly grasp a subordinate's muzzle in his mouth. This is a non-aggressive, very clear signal regarding who's the boss! 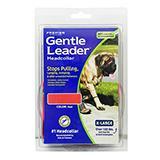 The Gentle Leader®'s nose loop encircles your dog's muzzle in this same manner, letting him know in his own language that you are his leader. 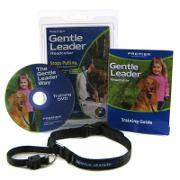 Dogs feel more secure when they know who the leader is. 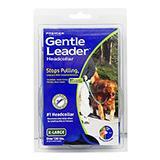 The Neck Strap - Gentle Leader® applies pressure to the back of the neck rather than the front of the throat, working with your dog's natural relaxation instinct with an amazing calming effect. Also, dogs tend to pull against pressure so the gentle pressure at the back of the neck causes the dog to pull backward, not forward. 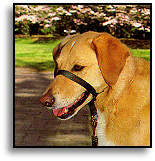 This means an end to leash-pulling forever! 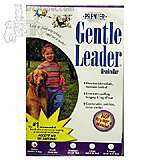 We stock the newer Gentle Leaders, which have 5/8-inch collar straps and narrower 3/8-inch nose loops. 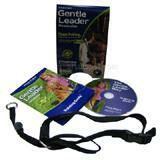 The narrower strap generally fits better and provides better control. Note: for strength reasons, the narrow nose loop is not available in the Extra Large size, which remains a 5/8 inch strap.